More than 750 alumni and their guests gathered on campus for a weekend of inspiring conversations, exciting activities, riveting lectures, memorable performances, and lasting connections during ¡Adelante Tigres! Celebrating Latino Alumni at Princeton University, March 30 - April 1, 2017. 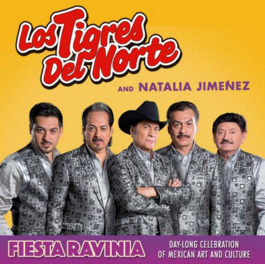 Fellow TIGRES, family, & friends - please join the Princeton Club of Chicago and the Association of Latino Princeton Alumni (ALPA) as we continue the celebration in Chicago with a day of Mexican art and culture plus a concert featuring the perfect band for Princetonians: Los Tigres del Norte together with Natalia Jimenez! For a video clip of their performances, click their images to left and below. For Directions, Click HERE. Roundtrip via Metra North is only $7! Join NOW to receive PCC Member priority reservation for Club events, member pricing, and to support Princeton events and service opportunities. Membership is free for Class of 2016, but you must join. Membership starts at only $25/year.